Underground Gas Line Installation | J.W. Brian Mechanical. Plumbing and Heating. Need a gas line ran to your garage or shop? Feel free to give us a call for an on site quote. We can either dig the trench, or install in a trench provided. Often a client will provide the trench to save dollars. 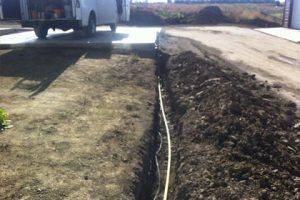 Just a little tip, you can install the gas line and electrical in the same trench. As well, a common question, the trench by code needs to be a minimum 15 inch deep.